CHEF LU Roasting, Rice Topping & Egg Tart Shop is a shop like you’ve never seen before in the Philippines. 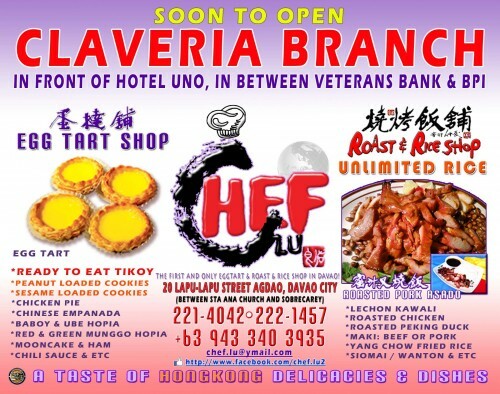 The CHEF LU Roast and Rice shop offers Rice Toppings of Roasted Pork “Asado”, Roasted Chicken, Lechon Kawali, Sweet and Sour Pork, Stir Fried Beef with Red and Green Pepper, Braised Beef Brisket among others to start with. And the Sauce for Roasted Foods are to die for! While the CHEF LU Egg Tart Shop is a bake shop specializing in Flaky Crust Egg Tarts and other Chinese baked goodies such as Chicken Pie, Chinese Style “Chive Stem or Kuchay” Empanada, Cantonese Mom’s Hopia, Almond Cookies, Special Ube and Mongo Hopia and a variety of Chinese food products such as Salted Dumplings, Stick Pot Dumpling, Pork & Vegetable Buns, Five Spices Kikiam, Chef Lu’s XO Sauce & Special Chili Sauce & etc. On the other hand, we had been manufacturing Mooncakes (during the Autumn Moon Festival season) for more than thirty (30) years now. With a quality comparable with those made in Hongkong, it has gained fame all around the world. We are bringing Hongkong to the Philippines! Thus, we assure you of the optimum qualities of our products. Our Head Baker and Chef is an Executive Chef from Hong Kong who has been in the industry for over fifty (50) years. Chef Lu Liong Yu himself is a certified Chef and Professor teaching Chinese cooking lessons in Manila since the early 70’s under the school name CCAC, more formally known as the “Chinese Culinary Arts Center”, a center for authentic Chinese cuisine. He has been teaching Dimsum, Roasting, Family, Banquet and Party as well as Vegetarian Dishes. 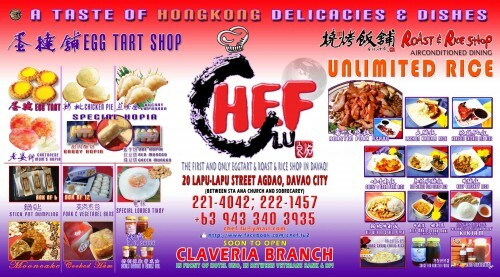 Although CHEF LU just started operating last January 2011, our concept has already gained the approval of SM City Head Office and Ayala Abreeza Mall. Also, we have received various offers for Franchising because they saw that this company has a very promising future. Currently, we are operating a small Egg Tart Shop in front of our main office and commissary site located at Lapu-Lapu, Agdao. CHEF LU is looking forward to further expansion in the very near future. Come and visit us or call the following numbers for your orders.